Incursion into implantation in Nigeria was first made in Jos (2005) at ECWA Evangel Hospital; now Bingham University Teaching Hospital (BUTH) with explanation as its outcome. The cochlear implant team was then lead by a missionary team of otorhinolaryngologists from the United States including the first author, who has since then made several skills acquisition visits to India and the United States of America learning the art of CI. The implants were donated free for implantation on these patients. The indications for CI surgery abound in our environment especially in the meningitic belt, Nigeria inclusive. It is thus the aim of this communication to document our experiences with a series of profoundly deaf Nigerians and their management outcome. DI is a 50-year-old female Nigerian intensivist nurse of a specialist hospital in Jos. She presented to the ear, nose, and throat outpatient clinic of BUTH with hearing loss of 10 years duration. There was no antecedent history of febrile illness. She had several unnamed parenteral medications after which she developed sudden profound hearing loss within 24 h, but presented 2 weeks later. She did not benefit from body worn hearing aid. She commenced special education lectures in sign language at University of Jos as an interim measure. General examination revealed a healthy looking, middle-aged lady; while otological examination showed normal bilateral external ears, patent external auditory canals, and shiny and intact tympanic membranes. The tuning fork tests (Rine's and Weber's test) elicited no response. Her pure tone audiogram threshold was 95 and 110 dB for right and left ears, respectively. Computerized tomographic scan (CT scan) of petrous temporal bone showed minimal cochlear ossification. Other investigations were within normal range. An assessment of bilateral profound sensorineural hearing loss secondary to ototoxicity was made with recommendation for CI, but finance hindered the implantation. She had a right CI via postauricular incision with extension into the parietal region on charity basis a year after, but subsequently extruded due to infection. KT is a 45-year-old university lecturer who developed a postmeningitic hearing loss of 10 years duration. He contemplated suicide otherwise no other systemic complaints. Clinical examination revealed a depressed otherwise healthy young man. The pure tone average was greater than 100 dB hearing loss bilaterally. Other investigations were essentially normal. His CT scan revealed patent cochlears bilaterally. Assessment of profound bilateral postlingual deafness secondary to meningitis was made. CI was also recommended, but there was no financial support. He later had the right ear implanted via postauricular incision with extension into the parietal region, but the implant subsequently extruded due to infection. About 6 months later, he had the left side implanted in USA, stimulated, and mapped. He has returned to resume work in Nigeria with good hearing. EO is a 19-year-old male, who developed meningitis and profound deafness at the age of 2.5 years. He was sent to the school for the hearing challenged to pursue education, but left the school due to frustration. Clinical examination revealed a healthy young man with bilateral profound hearing loss and pure tone average greater than 100 dB in both ears. Assessment of bilateral profound prelingual hearing loss secondary to meningitis was made. He was recommended for bilateral CI to restore his hearing back to normal as in case 3. The investigations - CT, urea, and electrolytes (U/E) were normal. He had his surgery on 16 October 2012 as day case surgery. He was mapped a week later, fine-tuned fortnightly twice. He has auditory memory for the few words he learnt during the perilingual period before his illness only. He has started speech therapy and returned back to Nigeria to continue the speech therapy. OS is a 28-year old, newly graduated medical Doctor who became deaf at age 21 years after a febrile illness in 2002 during the 2 nd year of his medical undergraduate study. He was then diagnosed as typhoid septicemic illness and spent the last 5 years of studies in the medical school copying notes from classmates. He solicited for an interpreter and examiners to write out questions for him to answer in clinical/practical examinations. This routine continued till the final year in 2012. In 2009, he was reviewed by an otolaryngologist and the clinical findings were those of normal healthy patient except for the pure tone average which was greater than 110 dB bilaterally. He was diagnosed with bilateral profound postlingual sensorineural hearing loss secondary to typhoid septicemia with a recommendation of bilateral CI; estimated to cost about 11 million naira (65,000.00 US dollars) then; to restore his hearing back to normal. An appeal for assistance yielded no result 2.5 years later. In the final year, he had a challenge because he was told he could not graduate because of this handicap. An American missionary, otologist and neuro-otologist agreed to carry on the surgery free in the United States. His investigations (CT and U/E) were normal except for the cardiovascular system which revealed a subtle murmur. Further evaluation with echo revealed a normal heart. He had his surgery on the 23 October 2012 as day case surgery. His activation and fine tunings were on the same day as in case 3. He is back to work as a houseman in Jos University Teaching Hospital Nigeria. HA is a 3-year-old girl. She developed cough and fever at the age of 8 months for which she was diagnosed pulmonary tuberculosis and commenced on antituberculous drugs for about 2 weeks in a specialist hospital. She was noticed not to be improving warranting her referral to the Jos University Teaching Hospital where she was diagnosed as suffering from cerebral malaria and cerebrospinal meningitis; but further referred to BUTH because of ongoing industrial dispute at that time, and finally had treatment for both conditions using quinine, chloramphenicol, and genticin, respectively. After about 3 weeks of treatment, the mother noticed she was no longer responding to sound any more. Her free field audiometry showed a response to sound above 70 dB only. She was diagnosed as suffering from prelingual bilateral profound hearing loss secondary to ototoxicity/or febrile illness. A recommendation for cochlear implant surgery was made, but fitted with bilateral hearing aids for 22 months prior to her surgery because; she lacked the finance for the implantation until help came her way through missionary for free implant surgery. Her investigations of CT, U/E were found to be normal. She had her surgery in January 2013 as day case surgery. A MED-EL cochlear implant (pulsar) type was implanted. She is currently undergoing intensive therapy with her cochlear implant [Figure 1] and [Figure 2]. KJ is a 34-year-old mother of three. She developed progressive hearing loss and became profoundly deaf 2 years ago. Prior to this she had used hearing aid for about 4 years. She pulled out of computer school when hearing aid was no longer of benefits to her. She is also a known asthmatic. Clinical examination revealed a healthy young woman with bilateral profound hearing loss and pure tone average greater than 100 dB in both ears. Assessment of bilateral profound postlingual hearing loss secondary to unknown cause was made. She was recommended for bilateral CI as the only viable. Finance prevented her implantation for about 18 months. Her investigations of CT and U/E were found to be normal. She had her surgery on the 19 February 2013 as day case surgery. A Medel cochlear implant (pulsar) type was implanted. She is currently hearing with her cochlear implant. Six patients had CIs for profound hearing loss. The first two were done as inpatients in Nigeria (2005); whereas, the rest were as day cases in USA. Their ages range from 3 to 50 years with an average of 29.8 years. The mean duration of illness was 8.6 years. There were three males and three females. There were four postlingual and two prelingual hearing loss implanted 17.5 and 1.8 years later. Prophylactic antibiotic was administered to the Nigerian group, while the USA group had full 10 days course of antibiotic. The Nigerian group had explantation; one of the patients in Nigerian group later had successful implantation on the opposite ear in USA. Implantation in the United States group was uneventful. The prelingual deaf are still undergoing rehabilitation. All the previous postlingual deaf patients are currently hearing with their implants [Table 1]. Cochlear implant consists of two parts; the internal receiver and external transmitter components. The internal components consist of electrode arrays and a stimulator (receiver) while the external component consists of a microphone, a speech processor, and a coil. Presently, it costs about $60,000.00 for procurement and surgery for a patient, implant alone costs about $40,000.00;  which is above the reach of ordinary Nigerians in employed labor. A collaborative effort by MED-EL (Austrian based) company and local group provided six free implants which led to these implantations. The six patients in this series could not afford the cost of the surgery. Our study is predominantly adult patients and the mean duration of illness was 8.6 years. This sharply contrasts that of Brito et al., in Sao Paulo, Brazil where they had pediatric preponderance, lower hearing loss duration of 6.3 years but similar equal gender ratio. Theirs was in a training center with a large pool of patients. The study is in conformity with that of Kandogan et al.,  in Izmir, Turkey who had an adult study population except for higher age range of 21-56 years, average duration of deafness of 11.4 years, male preponderance, higher number of cochlear implant candidates, and the use of three different types of cochlear implants namely MED-EL, cochlear, and advance bionic. 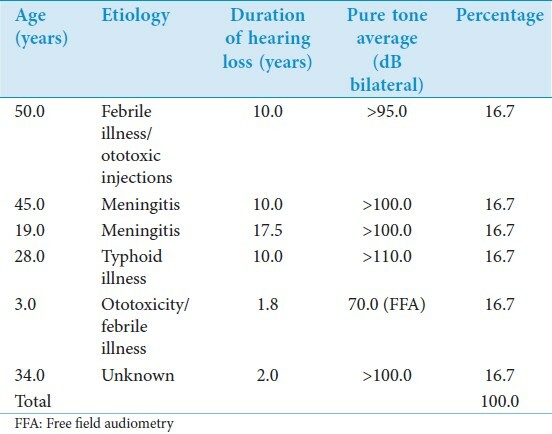 In our study; only the various types of MED-EL cochlear implants were used [Table 2]. Cochlear implant is indicated in patients with prelingual or postlingual deafness. Greater level of success can usually be achieved in patients who are postlingually deaf. Prelingually deaf patients can be successfully implanted especially at a younger age of one to 3 years. Postimplantation fine tuning of the cochlear implant program is required for all patients, but prelingually deaf individuals require additional intensive postoperative speech therapy. This is the case with our prelingual patients who are presently undergoing intensive post-cochlear implant speech therapy. Overall, speech understanding improves greatly 2-3 years postimplantation. In our series, all the four previous postlingual deaf patients had improved speech understanding within 2 weeks and returned to work within 6 weeks except the previous prelingual deaf who are still undergoing intensive speech therapy. Implantation is best done within the first 3 years (pre- or perilingual) of life, even though the period of neural plasticity extends up to 5 years of life. , One of our prelingual deaf patients had implantation at 19 years of age, a period far beyond the neural plasticity. All our postlingual bilateral profound hearing loss patients had no benefit from conventional hearing aids and consented to have CI which was the only viable option left. The surgical technique involves skin incision, a cortical mastoidectomy with facial recess approach and cochleostomy. Careful attention need to be paid to skin incision and flap reconstruction by obeying the width length ratio of 1:3 to ensure blood supply and avoid flap necrosis. In our series, we did not have any flap necrosis. The incisions were closed in layers; periosteum to periosteum and skin to skin; finally a mastoid dressing was applied and all (USA group) sent home 8 h postoperatively with oral antibiotic medications. Cochlear patency is very important in terms of cochleostomy and should not be overlooked especially with history of meningitis, labyrinthitis, and trauma to petrous bone. In our series, two (33.4%) of the patients had meningitis. Ossifications can be confirmed on radiological examination (CT scan) or better still with magnetic resonance imaging (MRI) in early ossification preoperatively, though small ossifications can still be missed using these radiological techniques. , Ossifications may make cochleostomy and electrode insertion difficult or impossible. One of our patients with meningitis had minor ossification noted intraoperatively, but still had a complete and successful electrode insertion. To make full electrode insertion possible, hyaluronic acid was first injected into the cochlear (USA) group to make it patent. 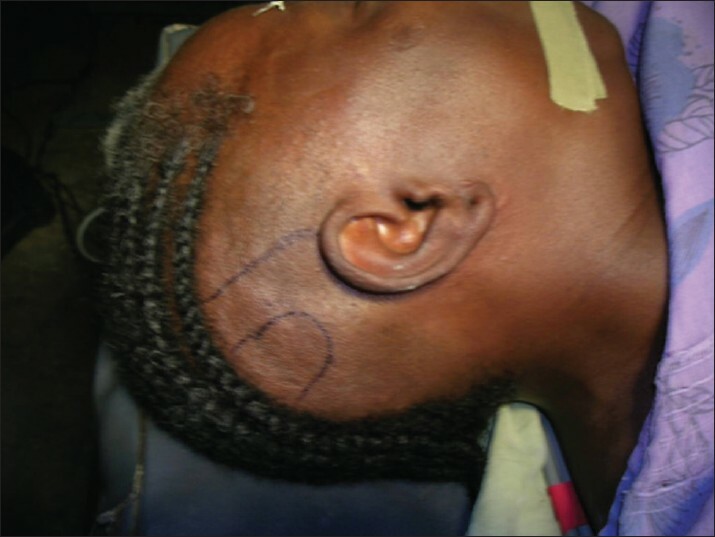 In contrast, the Nigerian group used tester electrode to ensure patency before the real intracochlear electrode was passed. Activation of cochlear implant is usually carried out 1-4 weeks postimplantation depending on how fast postoperative edema resolves. Three of our patients were activated within 2 weeks postimplantation except the doctor and the youngest patient who were activated a week after implantation. They had mappings forth nightly and have performed well 8 weeks postoperatively. The postimplantation performance was measured using hearing in noise test (HINT) and consonant nucleus consonant (CNC) words performed 2 weeks postoperatively. The two postlingual hearing loss patients had HINT and CNC of 80% each, while the prelingual adult patient had 20%. Three of our patients have returned back to work. One as university lecturer, the other just commenced his housemanship, and the last resumed her studies. Several challenges were encountered in these implantations that need to be highlighted to make future implantation surgery in Nigeria easy. Apart from cost earlier pointed out, issues arose that needed to be circumvented to ease implantations. The first issue was that these implantations were carried out on charity basis because of collaboration between local and international team to overcome most of these obstacles. The setup, manpower, cost, and equipment in our environment are not sufficient to allow these implantations except for the collaboration. The surgical techniques have evolved over the years to improve healing. Various skin incisions exist such as the preauricular with extension into the parietal skin and C-shaped incisions without extension. Workers like Brito and colleague  prefer the inverted "S" or small "S" and C-shaped incision to minimize complications. The choice depends on centers and experience where the surgical technique is learnt. Craters or well are sometimes created for the implant to sit in on the parietal bone; others create pericranial pocket for the implant without the crater. The implant hold down techniques also varies from creation of tie down holes on each side of the crater to the use of mesh and titanium screw to hold down the implant especially with the creation of pericranial pocket. In our cases, the Nigerian group had the preauricular incision with extension, crater for the implant to sit in and tie down hole were used to hold the implant; whereas, the USA group had the C-shape incision without extension, pericranial pocket with mesh, and titanium screw to hold the implant down without the crater, tie down holes, and the use of suture. We did not use the inverted "S" nor the small "S" at all. The later technique is quicker and less complicated. Theater infection control is of utmost importance or explantation may result. Clark  et al., noted that theater measures and antibiotics are important factors in successful cochlear implant; and that sepsis can result in explantation. Clark et al.,  categorized measures to prevent cochlear implant surgery infection as preoperative, theater routine, use of horizontal laminar flow filter units, correct surgical technique, and low threshold for the use of systemic and local antibiotics. The Nigerian group got infected resulting in explantation. Our antibiotic use in the USA group agrees with that of Brito and colleague,  who recommended that patients should be on routine antibiotics for at least over 7 days to avoid infection. This however is in conflict with findings of Hirsch et al.,  and Baker and Pringle  in USA and UK, respectively who observed that prophylactic antibiotics usually as single dose was sufficient to prevent major wound infection in cochlear implant surgery in USA. Baker and Pringle noted that 100% of UK cochlear implant surgeons use antibiotic prophylaxis, but however, the type and duration varies between centers and that the regime does not adhere to surgical principle of antibiotic prophylaxis strictly. Our Nigerian group had prophylactic antibiotic as recommended by Barry and Baker and Pringle, but however got infected probably due to the theater environment. Thus we recommend the routine use, instead of prophylactic antibiotic and improved theater environment. Support staffs-audiologist, speech therapist, and speech and language pathologist are essential and integral part of successful cochlear implant team. A survey by cochlear implant surgeons from the House Institute by Sanders  and coworkers revealed that the most important on ground requirement is the presence of audiologist (83%) rather than concern for infection in developing nations like ours. In our case, we have an audiometrician who has been involved in cochlear implant activation; and has gone for further training outside Nigeria. However, activation and the services of the other staff can be successfully managed through telemedicine with good result comparable to cochlear implant studio as opined by Ramos et al.,  though this opinion is countered by Hughes and coworkers  who argues that speech distortion is noticed when telemedicine is used for activation without audiometric booth. Our Nigeria group had activation through telemedicine with good speech. Power source backup and backup equipments are essential as noted by Emmanuel and Samuel  especially in Nigeria where sudden disruption of electricity supply or surge cause these high tech equipments to malfunction and go into mode that require time lapse to restart or get completely burnt out. Without backup, the surgery might terminate prematurely. In our case in Nigeria, we had prolonged operative time of 4 h as a result of power interruption and delayed equipment restart. CI for the profoundly deaf is feasible in Nigeria with proper planning, collaboration between local and international teams. However, there is the need to ensure an optimal environment and personnel training for a highly successful cochlear implant program in Nigeria. 1. Prevention and control of deafness and hearing impairment. Report of an inter-country consultation, Colombo, Sri Lanka 2002. New Delhi: WHO Regional Office for South-East Asia; 2003. 2. National Ear Care programme (NECAP), National Survey 2000-2002. Nigeria, National Ear Care Centre. 3. Fee GA. Use and limitations of hearing aids. Can Med Assoc J 1947;56:366-71. 4. Hochmair I, Arnold W, Nopp P, Jolly C, Muller J, Roland P. Deep electrode insertion in cochlear implants: Apical morphology, electrodes and speech perception results. Acta Otolaryngol 2003;123:612-7. 5. Proops DW. Adult cochlear implantation: The Birmingham and United Kingdom experiences. Otorhinolaryngol Clin North Am 2001;34:447-53. 6. Zeng FG. Cochlear implants in developing countries. Contact 1996;10:5-9. 7. Olusesi AD, Nwawolo CC. Cochlear implants in Nigeria: Present, Problems and Prospects. Proceedings of the annual scientific meetings of Otorhinolaryngological Society of Nigeria; 2003. 8. Adoga AS, Adoga AA, Nwaorgu OGB, Anthis J, Green JD. Cochlear implantation and internet stimulation in Jos, Nigeria. Proceedings of Otorhinolaryngological Society of Nigeria (ORLSON) 15 th Annual Scientific Conference and general meeting; 2005. p. 26-7. 9. Akpede GO. Presentation and outcome of sporadic acute bacterial meningitis in children in the African meningitis belt: Recent experience from northern Nigeria highlighting emergent factors in outcome. West Afr J Med 1995;14:217-26. 10. Luxford WM. Surgery for cochlear implantation. In: Brackmann DE, Shelton C, Arriaga MA, editors. Otologic Surgery. 2 nd ed. Pennsylvania: W.B. Saunders Company Philadelphia; 2001. p. 341-9. 11. Roland PS. Cochlear implants in Adults and Children. In: Gulya AJ,. Minor LB, Poe DS, editors. Glascock- Shambaugh Surgery of the Ear. 6 th ed., Ch 35. Shelton: Peoples Medical Publishing House; 2010. p. 583-615. 12. Brito R, Monteiro TA, Leal AF, Tsuji RK, Pinna MH, Bento RF. Surgical complications in 550 consecutive cochlear implantation. Braz J Otorhinolaryngol 2012;78:80-5. 13. Kandogan T, Olgun L, Gultekin G. Complications of cochlear implantation in adults. KBB-Forum 2006;5:73-6. 14. Cohen NL, Waltzman SB, Fisher SG. A prospective randomized study of cochlear implants. The Department of Veterans Affairs Cochlear Implant Study Group. N Engl J Med 1993;328:233-7. 15. Gluckman GL. Renewal of certification study guide in otolaryngology head and neck surgery. In: Assessment and management of profound hearing impaired patient. 1 st Ed. Iowa: Kendal/Hunt Publishing Company; 1998. p. 126-35. 16. Kileny PR, Zwolan TA, Ashbaugh C. The influence of age at implantation on performance with cochlear implant in children. Otol Neurotol 2001;22:42-6. 17. Gantz BJ, Tyler RS, Woodworth GG, Tye-Murray N, Fryauf-Bertschy H. Results of multichannel cochlear implant in congenital and acquired prelingual deafness in children: Five-year follow-up. Am J Otol 1994;15:1-7. 18. Robinson K. Implications of developmental plasticity for the language acquisition of deaf children with cochlear implants. Int J Pediatr Otorhinolaryngol 1998;46:71-80. 19. Gibson WP, Harrison HC, Prowse C. A new incision for placement of cochlear implants. J Laryngol Otol 1995;10:821-5. 20. Gilles H, Millard DR. The principles and art of plastic surgery. Vol. 1. London: Butterworth and Co Limited; 1957. p. 115-32. 21. Gantz BJ, McCabe BF, Tyler RS. Use of multichannel cochlear implants in obstructed and obliterated cochleas. 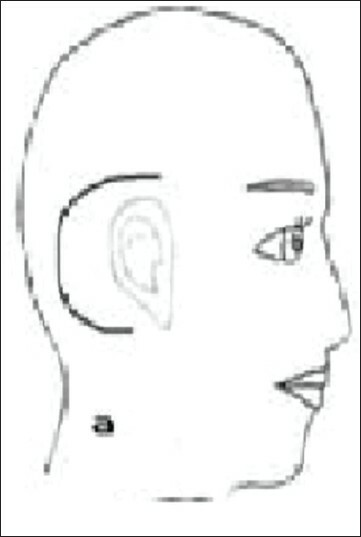 Otolaryngol Head Neck Surg 1988;98:72-81. 22. Chaturvedi A, Mohan C, Mahajan SB, Kakkar V. Imaging of cochlear implants. Indian J Radiol Imag 2006;3:385-92. 23. Ramsden RT. Cochlear implants and brain stem implants. Br Med Bull 2002;63:183-93. 24. Bassim MK, Buss E, Clark MS, Kolln KA, Pillsbury CH, Pillsbury HC 3 rd , et al. MED-EL Combi40+cochlear implantation in adults. Laryngoscope 2005;115:1568-73. 25. Gerard JM, Monnoye V, Deggouj N, Gersdorff M. A classical retro-auricular incision in cochlear implantation. Mediterr J Otol 2005;1:105-9. 26. Clark G. Cochlear implants: Fundamentals and applications. In: Beyer RT. Surgery. New York: Springer-Verlag Inc.; 2003. p. 595-9. 27. Clark GM, Pyman BC, Pavillard RE. A protocol for the prevention of infection in cochlear implant surgery. J Laryngol Otol 1980;94:1377-86. 28. Hirsch BE, Blikas A, Whitaker M. Antbiotic prophylaxis in cochlear implant surgery. Laryngoscope 2007;117:864-7. 29. Baker E, Pringle M. Survey of prophylactic antibiotic use amongst UK cochlear implant surgeons. Cochlear Implants Int 2008;9:82-9. 30. Saunders J, Barrs D. Cochlear implantation in developing countries as humanitarian service: Physician attitudes and recommendations for best practice. Otolaryngol Head Neck Surg 2011;145:74-9. 31. Ramos A, Rodríguez C, Martinez-Beneyto P, Perez D, Gault A, Falcon JC, et al. Use of telemedicine in the remote programming of cochlear implants. Acta Otolaryngol 2009;129:533-40. 32. Hughes ML, Goehring JL, Baudhuin JL, Diaz GR, Sanford T, Harpster R, et al. Use of telehealth for research and clinical measures in cochlear implant recipients: A validation study. J Speech Lang Hear Res 2012;55:1112-27. 33. Emmanuel SO, Samuel O. Energy-cost analysis of alternative sources to electricity in Nigeria. Indian J Sci Technol 2012;5:1946-52.